The new stadium in Krasnodar has had its natural grass field since last spring, but it won’t be until later this summer that the first game will be played. After a couple delays already now the project was confirmed to be ready for opening early into the 2016/17 season. Previously Stadion Krasnodar was to be ready in fall of 2015, later spring of 2016. And while visually most of its infrastructure is ready, there’s still a lot to be done. One major missing element are the 36,000 seats (with a chance to expand by 4,000 later on). 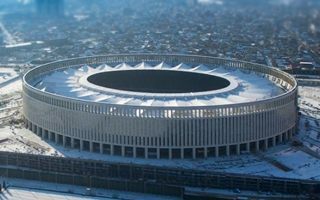 When confirming the new opening estimate, billionaire owner of FK Krasnodar Sergey Galitsky confirmed the new stadium won’t ever pay for its construction cost, but “that’s another issue”. For now delivering the luxurious venue is key. Galitsky had spent roughly 20 billion rubles ($260 million according to current rates) on the project. This makes it extremely expensive in terms of ‘price per seat’, even though the investor assures most materials were bought before the Russian currency collapsed.